For VEX Robotics World Championship 2015, like last year, Robot Mesh needed some kind of booth demo. The requirements are open-ended, but challenging. It's got to be made of (mostly) VEX parts, be novel, and be interesting. We wanted to do something with pneumatics, and something with the Pixy camera, since computer vision is both interesting and interestingly difficult. How about... a robot that plays pong against itself? Let's go over the hardware first. We used 2906s for the frame because they're cheap and rigid. A robot brain with one fried H-bridge pulled out of the junk pile was used for control, and a joystick with a broken partner port was used for joysticking. Even with heavy use of scrounged parts, final project cost came out to more than five hundred dollars. As the paddle had nonzero weight, it ended up moving slower than that, but in practice it ended up being good enough. 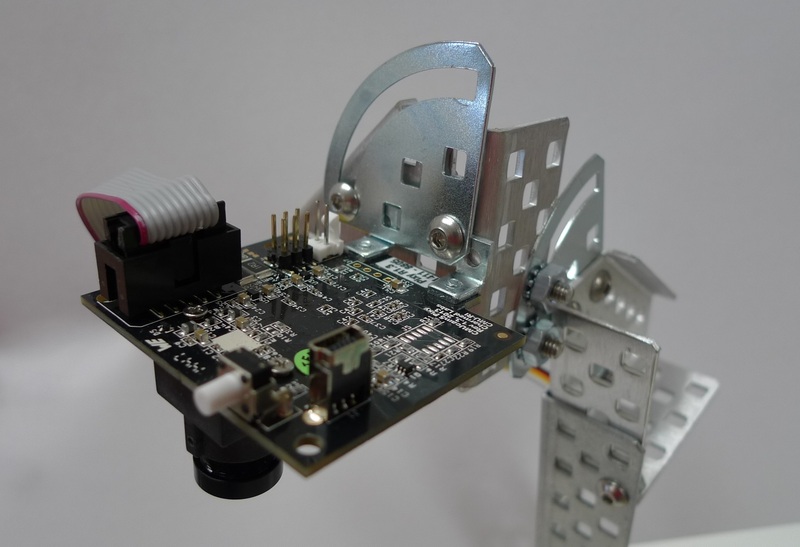 If you were to build your own Pongbot, you might try using the turbo gears. The Pixy is pretty neat. It does all the heavy processing onboard, then just outputs screen-space coordinates. (It can do color blob detection of 7 different hues, for up to 1000 different objects, though in practice you'd probably run out of sensor resolution and channel bandwidth before then.) It communicates with the Cortex by serial over the UART port. Like all computer vision sensors, it is exquisitely sensitive to lighting conditions. If the scene is partially lit by natural light, then a correctly calibrated sensor in the morning will give erratic and strange results in the afternoon. It's handy to keep PixyMon open so you can check to make sure that the Pixy actually sees what you think it sees. Two pitfalls when working with the Pixy: the camera is focused by threading the lens in and out of the camera housing. This thread is fairly loose: if there's any mechanical vibration at all, the lens will gradually drift out of focus. (Oddly enough, this makes signature recognition undependable, which you wouldn't expect) Also, the camera can either output live preview over USB, or data over the UART line. If you're in live preview mode, the camera won't output any data, and your robot will mysteriously stop working. The robot went together quite quickly, and after about, oh, ten seconds of system testing, it became obvious that the pneumatics were going to need to be directly connected to an air compressor, otherwise we would have to pump it up by hand every five minutes. A problem arose. All our air tool fittings used big chunky high-flow 1/4 inch NPT threads, while the reservoir was drilled and tapped for 1/8 inch NPT. An adapter of that size is kind of a rare beast, with the result that it was unlikely a general hardware store would have them, and we didn't want to wait around another two business days for a little piece of brass to be shipped to us from a warehouse in Ohio. 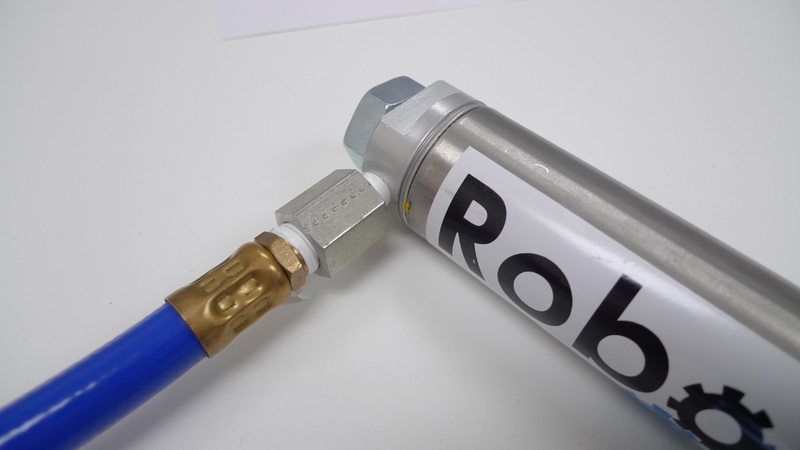 Where could we possibly find an obscure pneumatics adapter in Seattle? Why, at Western Fluid Components, just down the street from us, who happened to have a box of them just sitting on the shelf. If you're ever in town, and need some fluid components, they're your guys. Rubber bands were strung across the corners, to keep the ball from getting stuck where the paddle couldn't get at it. (A literal corner case.) Another problem discovered during testing that, due to the square edge on the paddle, it could end up entraining a ball directly next to it, so we chopped up a 1x25 steel bar and bent the ends in a vice so that the ball would be nudged away from the paddle during travel. One problem is that both sides of the Pongbot have a paddle, which means I need to specify the delay in two places. Copy and paste code is a pain to work with, since every time you want to make one global change, you have to go in and edit the code in multiple places. This results in a surprisingly large number of bugs, even in real, professional software. In the programming industry, the injunction against repeating yourself is called Don't Repeat Yourself. Let's take a look at something a little more complicated. This stack of if statements is designed to search through an incoming stream of data for the start of a new frame. The Pixy sync word is 0xaa55, sent least significant byte first. It transmits one sync word between each block (each object in the scene that it has recognized) and two sync words at the start of each new video frame. The while loop runs forever, reading one byte at a time off the serial port. If the byte it reads is FRAME_SYNC, 0x55, then it reads off another byte and checks to see if it's 0xaa. It proceeds in this fashion until it finds a complete frame sync, at which point it reads off 40 bytes, (Three object blocks) then breaks out of the infinite loop. This one's a little arcane. Let's say the checksum was decimal 258, which would be hex 0x0102. Now that we have the coordinates of where the ball is right now, we can make a stab at predicting where it will be. Here we define a class, instantiate it as predicted_loc_ball, then call it, passing y_pos, which we got from the camera earlier. This defines a special class method, like the on method of the vex.DigitalOutput class earlier. We give it the special method name __init__, which is executed when the class is instantiated. (A class constructor.) We pass another magic word, self, which is replaced with the variable name you chose when you instantiated the class, here predicted_loc_ball. We initialize the variables with 0.0 to force them to use the floating point data type. Python will return an integer as the result of dividing two integers, which on the one hand makes logical sense, but on the other hand means that 3 / 2 will return 1, while 3.0 / 2.0 will return 1.5. This code makes an effort at predicting the future location of the ball. When called, it takes the difference between the last two readings and uses it to guess at the current location, then does a weighted average of the guess with the sensor reading. It then takes that filtered result and guesses at the future location of the ball. Eventually I ran into a showstopping problem with I2C resets clearing the IME tick counter, and just punted and went with Pixy tracking of all three objects. This has the advantage of making the control code incredibly concise: it just tries to move the paddle until it lines up with the ball. The paddle motor is directly throttled with the offset from the ball, with a minimum power of 20, and a multiplier of 2 to get it to ramp up to 100 more quickly. Values higher than 100 are just clamped to 100 by the Motor.run API. The solenoid fires when the ball enters a 20x20 pixel box around the paddle. The __call__ method takes the x and y coordinates of both the ball and the paddle. The code here isn't as clear or concise as it could be, since to keep loop execution time down I'm only doing forward prediction on the ball's y position, and output filtering for the paddle y position. And that's pretty much it! 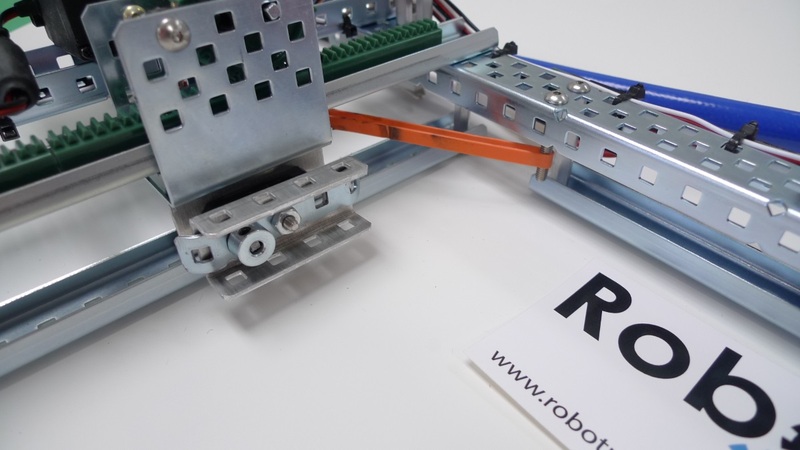 The code is up on Robot Mesh Python, so you can run it yourself. Check it out! Ah, but Don't Repeat Yourself! I had to change the value passed to sys.sleep() several times during testing, which meant I had to keep changing the comment in lockstep. Eventually I realized my error, and made the comment more generic. Never put a number from your program logic in a comment! 2: ^ This is why we define FRAME_SYNC as (0x55, 0xaa, ...) not (0xaa, 0x55, ...). Keeping track of endianess is one of the joys of programming against the bare metal. 3: ^ You can examine the internal variables of a class using the same syntax as a method call, of course, since a method is just a variable, like any other. print predicted_loc_ball.old will return 0.0. It is considered bad form to do so outside of debugging, however, and if your code depends on fiddling with a class's internal variables, instead of accessing them from its return value, then you are almost certainly committing a design error. 4: ^ VEX product 276-1321 is actually labeled and titled "Integrated Encoder Module", but the wiki and everyone I've ever talked to have called them IMEs, Integrated Motor Encoders. Even the Inventor's Guide pdf is confused, calling it an encoder module and a motor encoder at different points.